"Everything I know, see or hear, every part of my life is transformed into dresses. They are my daydreams, but they have passed from dreamland into the world of everyday items to wear." In my early twenties I worked at Saks Fifth Avenue in Kansas City and purchased a little sleeveless top by Christian Dior that read, "J'Adore Dior." And to this day, it's still one of my favorites. The design house has seen many creative directors come and go since Mr. Dior stunned the world with his debut collection in 1947. Carmel Snow, editor of Harper's Bazaar at the time, fell in love with Dior's silhouettes that had so much volume, yet minuscule waistlines. She said, "It's quite a revolution, dear Christian! Your dresses have such a new look!" Dior's current artistic director Maria Grazia Chiuri is adamant that the company needs to be about female empowerment as she demonstrated throughout the spring 2018 couture show. 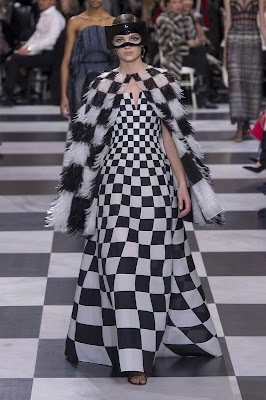 The black and white checkerboard runway set the scene and looked like it was snatched right out of a Tim Burton film. 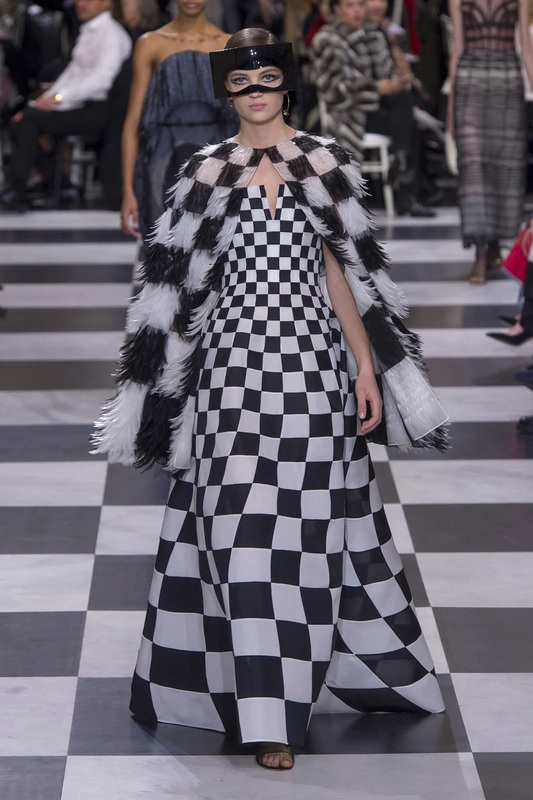 Dresses mirrored the two-toned floor in eye-catching prints for a dramatic effect and the result was much edgier than previous collections. Springtime always puts me in the mood to sew. I haven't done much sewing since last spring, but I got inspired the last few weeks and started to make a dent in my ever-growing pile of fabric. I made some new patterns out of muslin while draping on my dress form and got to work. The first three looks I created are light, airy, and full of color. I experimented with different necklines and hemlines. For the top of my fourth look, I sewed a two-way zipper into the top fabric that can be unzipped to expose the black fabric underneath. And then I continued sewing with my go-to black and white palette while throwing in a little dark blue for good measure. I saved the sparkliest fabric for last, which made me think of Art Deco. I was initially going to make a twenties flapper-style dress with it, but decided on a cinched waist with a fuller skirt that will be perfect for a night out.